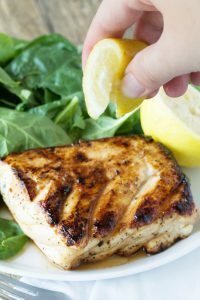 Try this “Fish on the Grill” made with teriyaki marinade — perfect for Summer-time! Rinse fish and pat dry, cut into 6 equal pieces if necessary. In a shallow dish, stir together butter, soy sauce, lemon juice, sugar, Worcestershire, ginger, garlic, and pepper. Add fish and turn to coat. Cover and refrigerate for 1 to 2 hours, turning occasionally. Prepare BBQ grill, heating to medium-high (or, a solid bed of hot coals with grill positioned 4 to 6 inches above). Coat grill with cooking spray and place fish on grill; cook with cover closed, 8 to 10 minutes, turning once, until fish is just opaque but still moist in thickest part (cut to test).